This week we tried out a new Addition Game for kids. It combined some one to one correspondence counting to the addition. It was fantastic practice, and the kids LOVED it! We’ll tell you all about it and show you where to get the supplies if you don’t already have them on hand. 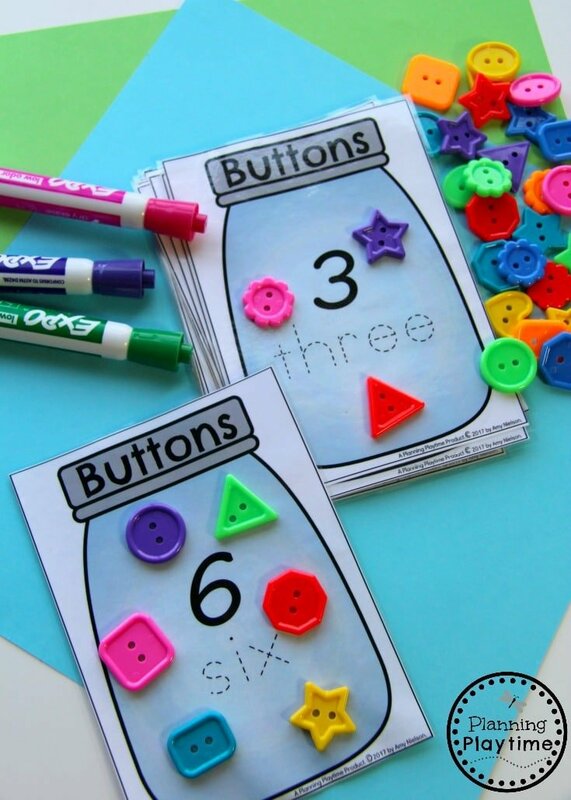 This addition activity is great for adding numbers under 10. Kids will practice this in kindergarten and first grade with the occasional review beyond that. 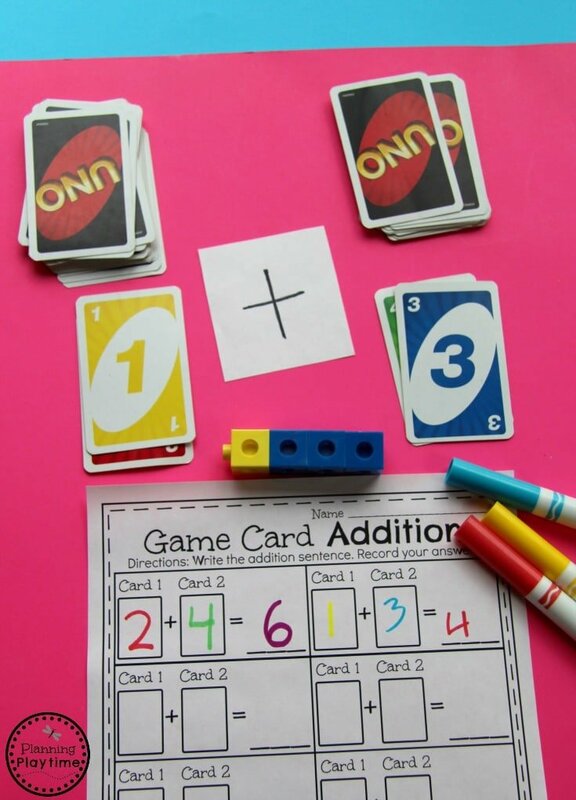 This activity makes a great math center for a classroom or extra practice at home. *We like to share products we find helpful with you. When you purchase through our links, we get a small kickback that we use to keep our supply closet stocked. Visit our Full Disclosures page for more information on affiliate links for this site. I prepped the activity by pulling cards numbered 0-9 out of our Uno deck. We shuffled the cards and split them into two stacks. The plus symbol was a sharpie on a square of white paper. You can stop here if you want and have the children flip two cards at a time and add. This would be a more advanced version for children that are already comfortable adding but need addition practice. To help kids that are still learning to count, Snap Cubes bring a lot of extra fun and some one to one correspondence help. For both cards, I had the kids build the number out of a matching color of Snap Cubes. They could then push them together making the sum. This was a very visual way to do the addition as well as helping them count the sum correctly. Recording your work is so important. It’s fantastic number writing practice, but it also helps you see your addition sentences and allows a teacher or parent to check your work. Recording isn’t always my kids favorite part, but we made it a bit more fun using colored markers rather than our usual pencil. You can do either one, but it was a fun variation for us. We made a recording sheet to share. Fill out this quick form to it for FREE! Get the FREE Recording Sheet! Thanks for stopping by to check out our fun Addition Activity for Kids. Pin it to save the idea for later. Hi my name is Nomonde from Leondale Germiston SA, I like your ideas of teaching the little ones I have a day care centre with 10 children ages of 2- 4 years I’m always getting good skills from your website thank you very much. Hi Nomonde. I’m so happy you found us. Let us know if there is anything else we can do to help. 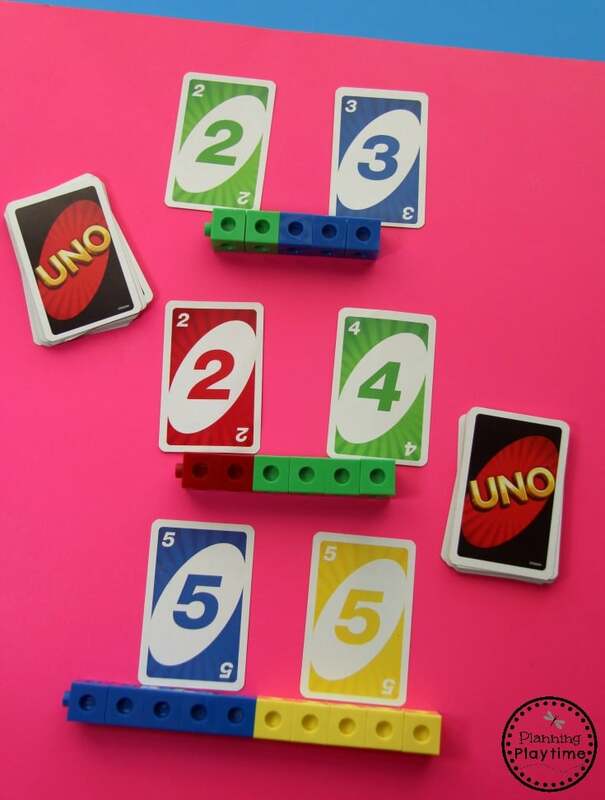 I would love to download the recording sheet for the Uno game but I am not able to – am I missing something? This is an awesome idea! Thank you! The form is near the bottom. You enter your email address and click the button. We will send you an email with your download. I hope that helps. Let me know if you have any other questions. Thanks for the reply – I’ve tried that at least 5 times with 2 different emails and have not received anything in my email:( I can’t figure out what’s wrong. Enjoy the day! Great idea and I can’t wait to try this. Thank you! I hope they love it. Love the auto math game. Can’t wait to try it with my firs-ties! I keep entering my email and click button. I haven’t received anything. I’m sorry about that. Try checking your spam and junk folders. Sometimes if your provider doesn’t realize we are email buddies, they’ll hide my emails from you. Let me know if I can be of further help. Thanks! I found it in my spam. Thanks for your help and the awesome card game idea! Pls how can i purchase these? The recording sheet is free. You can pick up the snap cubes at http://amzn.to/2yHiOxS. I’ve entered both my email addresses a few times to receive the free worksheet, but I still haven’t received anything. Thank you in advance for your help in resolving this matter. I’m sorry you’re having trouble with it. Make sure you check your spam folder. It may be hidden in there. Let me know if you still can’t find it. 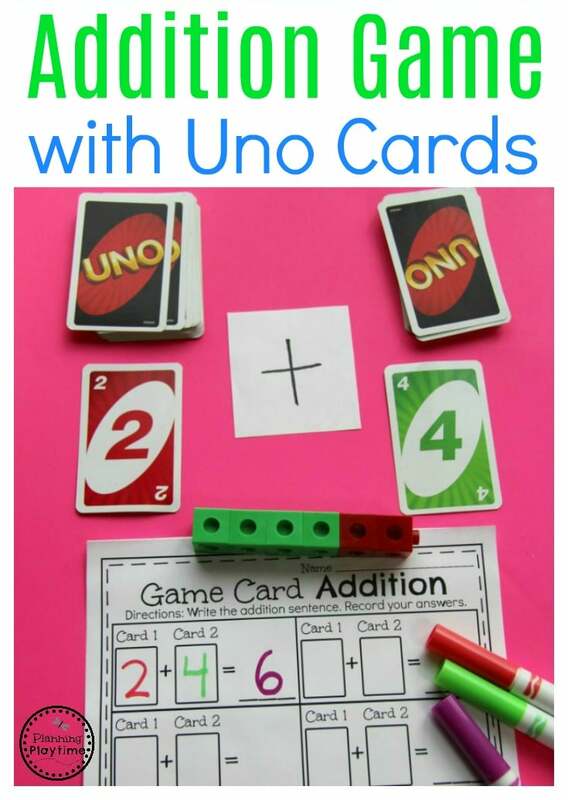 My first grade students will enjoy practicing their addition facts while playing this game with UNO cards! I love your ideas with the Uno Cards. What an awesome idea engaging the children with colors, hands on, and addition all in one. 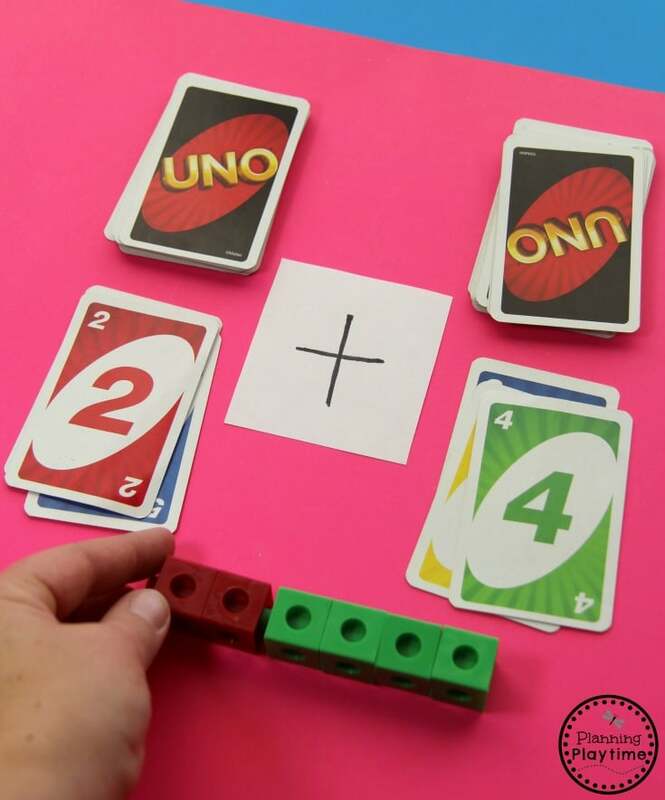 Would love the uno game and recording sheet!